The Power of One Person with a Huge Heart and the Courage to Follow it. A female medical doctor for Humla, Nepal. Eva Holmberg-Tedert (in the middle) and Jyoti Botsford (at Eva's left) with the medical, nursing and midwifery students in Kathmandu, Nepal. Humla is considered as one of the most remote and isolated regions in Nepal, reachable only by foot or small aircrafts which are irregularly landing in the district headquarter, Simikot. It is situated high in the Himalayas, in Karnali zone, North-western Nepal, bordering the Tibet Autonomous Region. Its elevation ranges from 1,524 to 7,337 meters above the sea level. This region has two very contrasting faces: On one hand, breathtaking landscapes, untouched nature, the purest air and organically grown food. 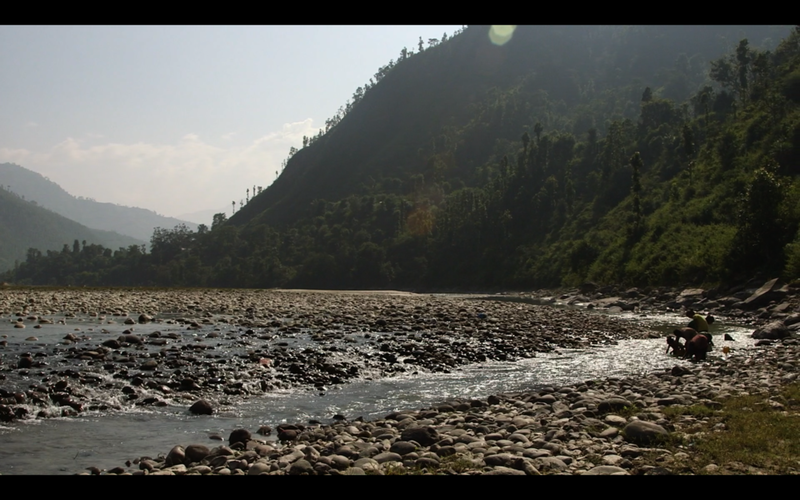 On the other hand, isolation has left Humla in a very precarious position where poverty and harsh living conditions are making this beautiful area a tough place to live and thrive in, especially in regards to health assistance and education. When Eva travelled to Humla, she had to take a flight and trek for nine days through the Himalayas in order to reach Pema Dechen's village. However, Eva was determined. Pema Dechen had proven to be an outstanding student and was willing to take her education further and help people in her area. The Society for Street Children of Nepal received a donation aimed at supporting a motivated Nepali student through medical college, so Eva was traveling to Humla in order to visit Pema Dechen's parents to discuss an opportunity for Pema to embark on a medical degree in Kathmandu. Pema Dechen's parents were delighted that her daughter was given this opportunity, the whole community welcomed the idea to have a local medical doctor among them and Pema was over the moon to be able to further her studies and help her people in the future. I need to pause here: this is huge. 1.A student from a remote area in the Himalayas going into Higher Education. 2. Studying a medical degree. 3. Becoming a medical doctor and returning to her village to serve the community at the same level than the shaman. Ten years ago, when Eva started talking to the street children in Kathmandu, she realised that the main reason why they had ended up in the streets was because their mothers had died. She kept enquiring and she learnt that the most common reason for women to die at a young age was childbirth. Eva likes to work both on the current problems but also on its causes. The problem: lots of children end up in the streets after losing their mums in childbirth. A cause: Nepal needed more health care professionals and birth assistants. A way forward: there are girls in need of a dignifying education. The education for medical professionals project was born. Ten young girls are currently benefitting from this initiative and the number is growing. These girls study in Kathmandu but will be returning to their places of origin all around Nepal to help their communities for at least five years. Butterfly Wings is a documentary film that tells the story of an ordinary woman, Eva Holmberg-Tedert, doing extraordinary things. We are filming in October 2017 in Nepal. We are launching a crowdfunding campaign on the 4th of September to finance it. Click here to find out more about it or watch the short video below for more information. Rathankot Village, where the school funded by The Gayatri Fund was rebuilt after the 2015 earthquakes. 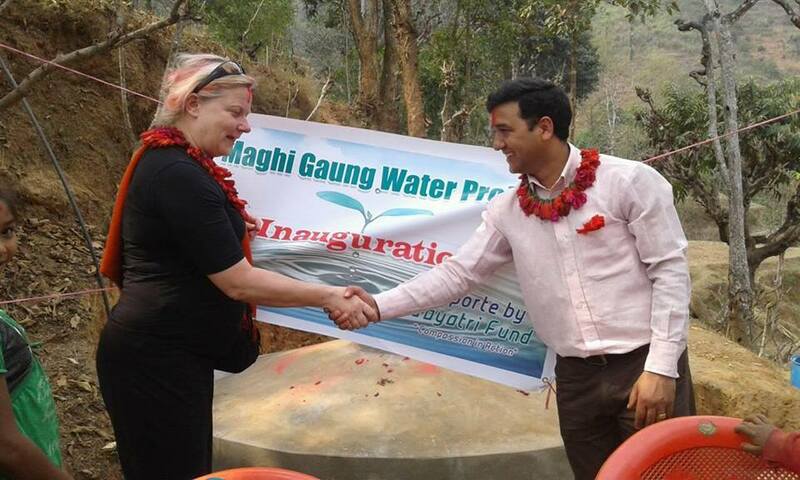 Watch Eva Holmberg-Tedert telling us about the school in Rathankot and a water project in Maghi Gaung. Butterfly Wings is a short documentary that shows how one ordinary person can do extraordinary things. It's the story of Eva Holmberg-Tedert, who we met in Nepal last year and we feel extremely honoured to tell her story. We are filming in Nepal in October 2017. If you want to get involved and become part of the producing team, please help us by spreading the word, like us on Facebook and donate as much or as little as you wish to our crowdfunding campaign, which will start the coming Monday, 4th of September. Thank you for being here. Namaste! Eva at the inauguration of the water project. When I arrived in Kathmandu, Nabaraj, Eva's driver, was waiting for me outside the airport. It was late in the evening but the tiredness of a long flight quickly vanished when I saw the magnificent spectacle in front of me: a city of lights. It was the first day of Tihar (Diwali in Nepal) and the buildings where sparkling in the thick night air. I was driven to Gokarna, a home for teenage girls that Eva had funded. She wouldn't arrive until later on and I was unsure what to expect. After cruising through a cacophony of car horns, loud music from speakers, drums and prayers, animal squawks, grunts and bleats, I arrived to Gokarna. The air was a little bit fresher there, the iron gate opened after I knocked and a group of vivacious girls between 7 and 17 years old came running to welcome me with a warm hug and thousands of questions! They told me about the earthquakes, how they were living in tents, how scared they were but also how much fun they had living all together outside and playing all day. It was love at first sight. After I learnt the stories of some of the girls before Eva found them, I could appreciate even more the tough but fruitful journey that each one of them and also Eva and her team had gone through. I found out that it wasn't just about helping one girl now, it was about giving them the education and tools to have a dignified life now and in the future. This will impact their children and their children's children. It is a small home, only 14 girls, but it is already changing the way Nepal sees and treats women (especially poor ones), one girl at a time. Why girls? There is an outrageous high percentage of street girls who are snatched at a very young age by human traffickers and some are even sold by their families. Eva is currently writing a book about this topic. The homes in Kathmandu protect and educate girls so they have a present, a future and can also heal their past. It was a truly heart-opening experience to listen to the Gokarna girls talking about their future careers and their dreams and how each one of them were committed to make Nepal a better place and help others. Right, I thought, I am here with you. As much as I can I am committed to help you. And here we are, traveling again to Nepal to produce Butterfly Wings, a documentary about how ordinary people can create extraordinary change. Eva Holmberg-Tedert is just one person helping a limited group of people, who will be helping others, who will help others... That's the power of true compassion. The girls in the picture above are Tenzing and Renuca. One morning they appeared outside my room 'dressed like Lakshmi', the Goddess of Abundance. They brought me breakfast and they asked me to take their picture. Renuca wants to be a doctor and Tenzing was not sure yet, either a clothes designer or a cyclist. The fact that they can even dream and feel that they have the choice to decide their future is already so powerful. They are learning to be free. Confident, empowered, intelligent, energetic, aware, skilled, compassionate. These girls and many like them are the future of Nepal. Butterfly Wings, as with Eva's projects, is multilayered. By telling Eva's story we are also spreading the word about how important each individual is and how every single person is a powerful agent for change. Each one of these girls will create a better world for themselves, their children, their communities, their country. We cannot be more honoured to be telling this story. We have been crowdfunding in the past and saving as much as we could ourselves. But to make this documentary we need as much help as we can have. If you feel called to help us tell Eva's story, please share our website, connect with us on Facebook and become part of our producing team by contributing with as little or as much as you wish when our crowdfunding campaign goes live on Monday 4th of September 2017. Thank you so much. Namaste! Eva is just one person. One person amongst billions, one person who felt called to make a difference and is now changing the world for the children of Nepal. However, Eva is no different from you and I. After a fateful encounter in Sweden with Pema Dorjee, a Tibetan Lama who works for the Dalai Lama in the exile, Eva learned of the plight on the streets of Kathmandu and the rural areas of Nepal, where thousands of children are left homeless, neglected or snatched by human traffickers taking advantage of a developing world and natural disasters. She could not remain indifferent. But there are still thousands of children living on the streets of Nepal and some say even thousands more girls are sold into prostitution. It seems like a fruitless battle but Eva shows that one person can make an enormous difference for the individual lives and future of these children and their children. She embodies a legacy that will ripple through time. Through her amazing compassion and selfless action, Eva teaches us that in order to create extraordinary change and make the world a better place, the only requirement is to have a truly open heart and enough courage to follow it. Eva's story deserves to be told. We will be filming in Nepal in October 2017 and are setting up a crowd-funding campaign with GoFundMe.com to help towards the cost. The campaign will be launched on September 2017. By donating whatever you can to this project you are helping us tell Eva's story. The money will go towards equipment costs, travel costs and production logistics and anything leftover will go directly to Eva’s charity projects. Most importantly, with your donation you will help us raise the profile of her work and expand her reach. There are still so many children who need help! Our crowd funding campaign will go live on the 4th of September 2017 and will last until the 24th of September. If you feel called to be part of this project and in order to keep up to date with our news and be reminded when the GoFundMe campaign is launched, you can join our mail list by filling in the form below or like us and follow us on Facebook. Eva Holmberg-Tedert with some of the Gokarna girls in one of the homes she founded in 2011.